NHibernate is a widely used open-source ORM solution for .NET Framework. It is well-known for its great flexibility in mapping .NET classes to database tables, because it supports most kinds of such mapping ever needed by developers. However, its is also well-known for its complex mapping both fluent and XML. To help beginner developers to get acquainted with NHibernate mapping, Devart releases NHibernate Mapping Samples application, which demonstrates 50 different mapping cases and how they are mapped using both fluent and XML mapping. 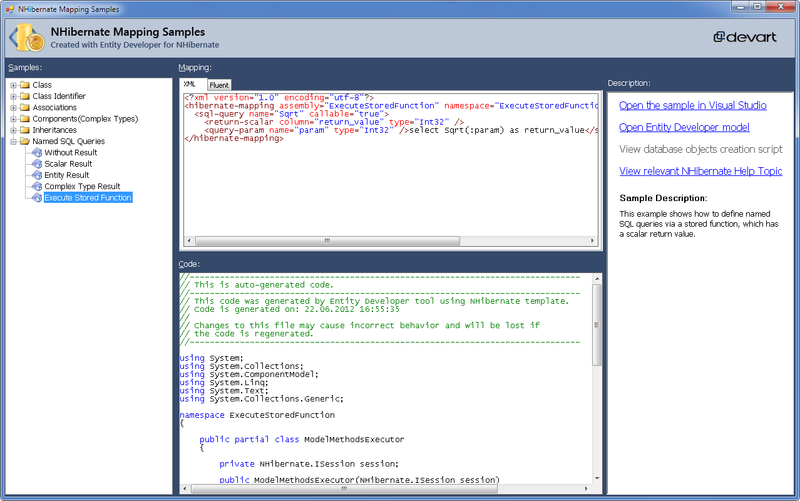 NHibernate Mapping Samples application does not require any third-party tools except for the .NET Framework. Simply launch the application and explore our NHibernate mapping samples. You can study the classes and mapping in the application window or open a Visual Studio project for each sample to check how it works in a real application. Database creation script (for SQLite) is available for each sample. You can also easily access NHibernate documentation page relevant to the opened sample. If you have Entity Developer for NHibernate, our ORM model designer and code generation tool, you may also open Entity Developer models that were used for generating mapping and classes for samples. Read more about NHibernate Mapping Samples in the NHibernate Mapping Samples article.